the innovativeness of use, technologies and benefits to users. Thermodyne’s Fluid Shelf® Technology heats fluid remotely to the precise temperature then sends the fluid to each shelf before returning it to the tank for instant recovery. Heat transfers to food by Conduction rather than Convection. Temperature distribution is precise and even throughout each and every shelf; therefore 100 % of the cabinet can be used. 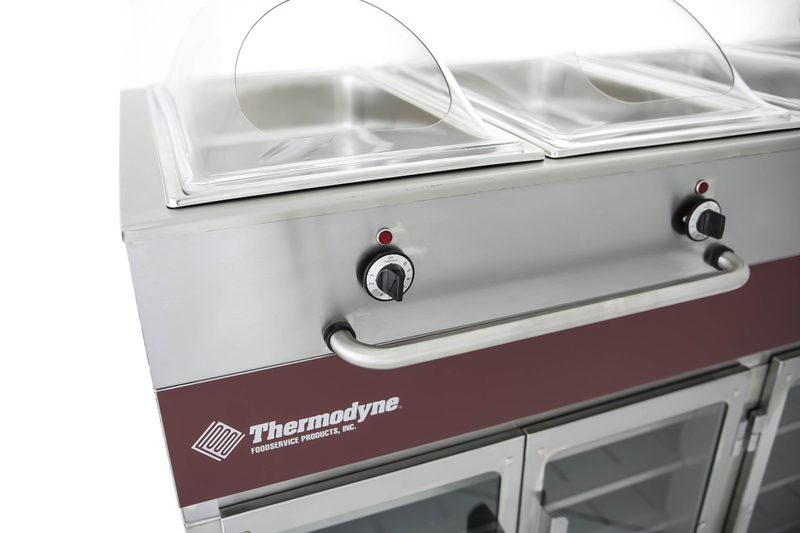 Thermodyne can safely maintain the perfect serving temperature of food for extended periods, without over cooking or drying out. Thermodyne can effectively be used for all proteins, vegetables, breads, and even deep-fried products all in the same unit at the same time. Since the heat is maintained in the shelf rather than in the air, food is protected from unstable environments such as door openings, cold spots or additional air flow. With no risk of temperature fluctuation, kitchens enjoy reduced shrinkage and waste, and minimal energy consumption. Heat emissions to the kitchen environment are very low, which also helps energy savings. Circulating air in a cabinet is often the culprit for cross flavoring, and since Thermodyne does not circulate hot air, this is totally eliminated. Some Thermodyne models even come without doors. A user-friendly temperature control system enables precision heating with minimal operator training, allowing for consistent results. Thermodyne helps alleviate space, time, and labor constraints, while assisting with HACCP compliance. Thermodyne will exhibit at HOST 2015, in Milan, Italy, booth number B12, Pav.02 and will also have equipment displayed at HOST’s Innovation Gallery.